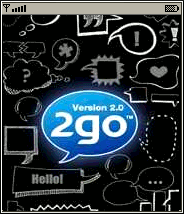 This is version 2.02 of the popular 2go chat and IM app. At 176KB it’s much smaller than the current version which is 262KB. If you have an older or low memory phone that can’t run current 2go versions this one may work. The app “2go” (176 KB) is ready to download or send to your phone as filename:”2go202″. am what is the use of it?And can i download it in my samsung Champ gt-3303k. Did you have VLC for 5230? No, I don’t have VLC for anything. There’s no Java ME version. I’m not familiar with the Cherry Mobile W20 but if it supports Java ME apps the 2go old version will probably work. What make and model phone are yiu using? Not with Free Basics. You can browse the site for free with Free Basics but Free Basics does not allow downloading with free data. If your phone supports WiFi you could download for free using a a free public WiFi hotspot. My nokia 206 is not enable to download anything from here.,they only says facebook data is not available in your country. You need paid data to download. Can i download this in o+? Will it wrok on nokia C1-01. Will it work on nokia X2-02? I don’t know, try it and see. Can I download this version on blackberry? Maybe. The only way to find out if it will work is to try it. I’ve heard of 2go via a friend but I’m Unable to login because it doesn’t give me the username option and it keeps telling me that I’ve entered the wrong username and password.